The primary motto of operative dentistry, undoubtedly, is to restore the tooth to its form and function. Lutz et al . referred to resin composite materials as viable amalgam alternatives given the materials' compressive strength, abrasion resistance, durability, and radio-opacity. Apart from the teeth that are subject to heavy occlusal stress and for patients who are hypersensitive to resin-based materials, posterior resin composite restorations have been well-accepted due to improvements in the materials and the development of better dentin adhesives. Microleakage is the most frequently encountered problems with posterior composites mainly due to polymerization shrinkage. According to Kidd, microleakage is defined as the clinically undetectable passage of bacteria and bacterial products, fluids, molecules, or ions from the oral cavity along the various spaces present in the cavity restoration interface. Two major properties of dental light cure composites that have to be improved are their polymerization shrinkage and the shrinkage-induced stress. The volumetric shrinkage of currently used composites ranges from 2 to 6%. This results in marginal gap formation leading to microleakage. If the contraction forces exceed the bonding strength at the interface, the resulting interfacial space can lead to staining, marginal leakage, postoperative sensitivity, and recurrent caries. Improvements of conventional bisphenylglycidyl dimethacrylate (Bis-GMA)-based composite materials through the addition of new monomers such as ethoxylated bisphenol-A dimethacrylate (Bis-EMA), urethane dimethacrylate (UDMA) in combination with superior fillers of nanoparticle size, have been proposed by manufacturers to reduce the contraction stress without altering their mechanical properties. There are two important strategies to reduce polymerization shrinkage, first is the reduction of reactive sites per volume unit and second is the reduction of shrinkage using different types of resin. Recently, siloranes derived from the fusion of siloxanes and oxiranes have been proposed as low shrinkage restorative materials. As they polymerize through cationic photoinitiation, they seem to have comparable properties and markedly reduced shrinkage compared with Bis-GMA based materials, thus representing a valid alternative to dimethacrylates. Therefore, this study aimed at evaluating and comparing the microleakage of restorations using silorane-based dental composite and methacrylate-based dental composites in Class II cavities. Sixty human mandibular molars freshly extracted for periodontal reasons without decay, microcracks, or previous restorations were chosen. The teeth were scaled for surface debridement and cleaned with tap water, polished with rubber cup and pumice. The teeth were stored in distilled water at room temperature until they were used for the study. Filtek P6O (3M ESPE, St Paul, Min, USA) methacrylate-based microhybrid composite. Pulpal depth of 2 mm. The cervical margin was located 1 mm coronal to the cementoenamel junction, so that all the margins were located within enamel. Buccal and lingual walls of the preparation were approximately parallel and connected to the gingival wall with rounded line angles. All the margins were kept as close as possible to a 90° cavosurface angle. All the cavities were prepared by a single operator and evaluated by another operator. Burs were replaced after every five preparations. Following cavity preparation, the teeth were stored in distilled water till the next procedure. The teeth were randomly divided into four groups with 15 teeth each and restored according to manufacturers' instructions. A Tofflemire Matrix band Retainer with universal metal matrix band was tightened around the tooth and held by finger pressure against the gingival margin of the cavity, so that the preparation could not be overfilled at the gingival margin. This also allowed the light to be directed only in the apical direction while curing the composite. All the 15 teeth were self-etched with Filtek P90 LS Adhesive Primer, which was applied in thin layer and light cured for 10 s using the light-emitting diode light curing unit. Next, Filtek P90 LS adhesive bonding agent, was applied and gently air dried. A second layer was applied, gently air dried, and light cured for 10 s. Filtek P90 LS (A3 Shade) composite was then placed in increments of 2 mm, which was judged with the William's graduated periodontal probe. Each increment was light cured for 40 s.
All the 15 teeth were matriced as Group I and total-etched with 37% phosphoric acid etching gel for 15 s and the etchant was rinsed off with water for 10 s and then air dried for 2 s. A layer of Adper Single Bond 2 bonding agent was applied onto the cavity surface and gently air dried. A second layer was then applied, gently air dried, and light cured for 20 s.
The restoration was done as for Group I, except that Ceram X Mono (M5 Shade) composite was used instead of Filtek P 90 LS. The procedure of restoring the 15 teeth of this group was similar to that of Group II, except that Filtek P60 (A3 Shade) composite was used instead of Ceram X Mono. This group served as the negative control. The procedure of restoring the 15 teeth of this group was similar to that of Group III, Filtek P60 (A3 Shade) composite was used. After restoring, the excess overhangs were removed with scalpel, surface finishing was done with Sof-Lex discs. Then they were stored in distilled water for 24 h before the next procedure. All the four groups were subjected to thermal cycling between 5°C and 55°C, for 3000 cycles with a dwell period of 30 s. The teeth were superficially dried after thermocycling. Then, apices of all the teeth were sealed with sticky wax. Two coats of nail varnish were applied all over the teeth except 1 mm around the restoration in Group I, II, and III. In Group IV (negative control), nail varnish was applied all over the teeth including the restoration. Then, the teeth were inverted and immersed in 2% rhodamine-B dye solution for 24 h under vacuum at room temperature. After 24 h of dye penetration, the teeth were washed in running water, and the nail varnish coating was removed with scalpel. The teeth were sectioned longitudinally in the mesiodistal direction using diamond disc [Figure 1]. The tooth sections were examined at the occlusal and gingival margins with a stereomicroscope under ×40, images were captured by the charged coupled device camera and the scoring was done [Figure 2]. Score 3 = Dye penetration into the entire cavity depth. Intergroup comparison of the occlusal and gingival margin dye leakage scores were done with the Mann–Whitney U-test, to identify any statistical significant difference. Level of significance is at P < 0.05. The occlusal margin of all the groups showed that there is no statistically significant difference between the Groups I and II, I and III, I and IV, II and III, II and IV. 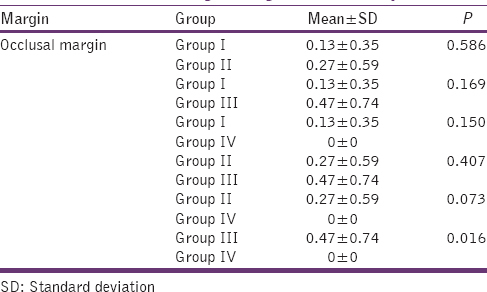 However, there is statistically significant difference between the Groups III and IV, Group III has significant leakage [Table 1] and [Graph 1]. The gingival margin of all the groups showed that there is statistically significant difference between Group I and II, Group I and III, Group I and IV, Group II and III, Group II and IV, and Group III and IV. 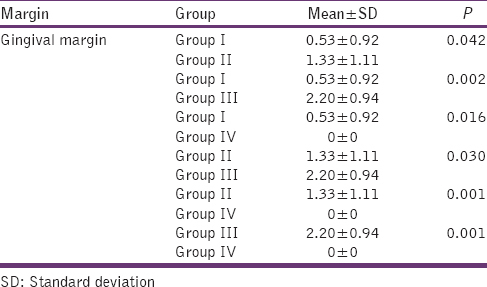 Among the experimental groups, Group I shows the minimum leakage followed by Group II, and Group III [Table 2] and [Graph 2]. The fact that composite restorations exhibit leakage at marginal interfaces with tooth structure has no surprise to the dentists. It has been known that conventional methacrylate-based composite restorative materials do not provide a complete hermetic seal, and numerous studies have demonstrated that the leakage of fluid occur between the restoration and the prepared tooth surface. 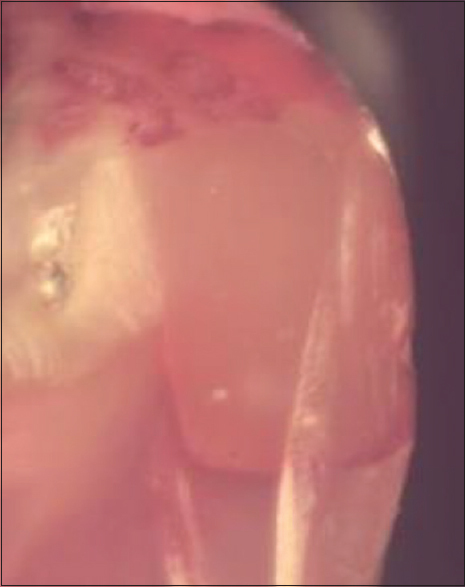 This marginal leakage or microleakage has been implicated as an etiological factor in the inflammation of the dental pulp following the insertion of composite restorations. Since the introduction of composite resins and their indication of use in low stress bearing areas initially, material science has developed to an extent such that the clinician today has a variety of composite materials at his/her disposal that can be used in versatile cavity preparations. However, a number of problems are associated while using dental composites, with the primary ones being polymerization shrinkage, moisture sensitivity, and lack of essential bonding to enamel and dentin. Payne et al . suggested that many studies show a variety of possible causes for the failure of composite restorations at the cavosurface margin of a Class II restoration. Even though clinical investigations have confirmed that the adhesive technique in posterior teeth is able to provide an acceptable performance, these materials are extremely technique sensitive and cannot prevent leakage at the cervical margins. The polymerization shrinkage and rheological characteristics of a composite depend primarily on the monomer types, and the ratio of the resin matrix, and the inorganic filler (type and content). The composites are composed of a resin matrix mainly Bis-GMA (bisphenol-A diglycidyl ether dimethacrylate), which was the first development of dental composite resins blended with triethylene glycol dimethacrylate (TEGDMA) as a diluent (mass ratio 70:30) and with inorganic fillers to improve physical properties. The average shrinkage value for methacrylates is 2–6%. In Filtek P60 restorative, in addition to Bis-GMA, the majority of TEGDMA has been replaced with blend of UDMA and Bis-EMA (bisphenol A polyethylene glycol diether dimethacrylate). Both these resins are of high molecular weight and therefore have few double bonds per unit of weight. The high molecular weight materials also have an impact on the measurable viscosity. The higher molecular weight of the resin results in less shrinkage. Inorganic fillers of this system are Silica/Zirconia fillers of (60 vol%) microhybrid type. One of the most important advances of the last few years in dentistry is the application of nanotechnology to resin composites. Nanotechnology is known as the production of materials and structures in the range of about 0.1–100 nm by various physical and chemical methods. The size of the filler particles lies around 8–30 µm in hybrid composites, and 0.7–3.6 µm in microhybrid composites, new fillers with size ranging from around 5–100 nm have been developed. Ceram X Mono restorative is a light-cure, nanoceramic restorative material for restoration of all cavity classes of anterior and posterior teeth. Its composition is dimethacrylate resin matrix, methacrylate modified polysiloxane (organically modified ceramic) filler, camphorquinone, ethyl-4 (dimethylamino) benzoate, barium-aluminiumborosilicate glass, methacrylate functionalized silicon dioxide nano filler. Filler particles are of size 2–3 nm and nanohybrid type (nanofiller-vol 15%, microfiller-vol 85%). Moreover, the small size of filler particles improve the optical properties because their diameter is a fraction of the wavelength of visible light (0.4–0.8 µm) resulting in the human's eye inability to detect the particles. Furthermore, the wear rate is diminished and the gloss retention is better. Recently, numerous attempts to reduce the shrinkage by changing the nature of the resin, solution for this target profile was achieved by the development of silorane resin. The low-shrinking Filtek P90 LS restorative is based on the new ring-opening silorane chemistry. Siloranes are a totally new class of compounds for the use in dentistry. The name “silorane” derives from its chemical building blocks siloxanes and oxiranes. The combination of these two chemical building blocks provides the biocompatible, hydrophobic, and low-shrinking silorane-base of Filtek P90 LS Low Shrink posterior restorative. It polymerizes by cationic ring-opening polymerization. It consists of quartz-modified with silane layer and yttrium fluoride fillers of microhybrid type of 75 vol%. Regarding the adhesive system, Filtek P60 and Ceram X Mono were based on total-etch system (Adper Single Bond 2), and Filtek P90 was based on self-etch system (Filtek P 90 LS Adhesive System). The quest for simplification of the chair-side adhesion procedure has probably played a significant role in the evolution of self-etch systems. This kind of adhesion reduces technique sensitivity because there is no need for a separate etching procedure and no rinsing is required, hence there is no risk of desicating the dentin surface. In addition, the important advantage of the self-etch approach over total-etch is that infiltration of resin occurs simultaneously. In this comparative in vitro study, silorane-based microhybrid composite showed less microleakage than the conventional methacrylate-based nano- and micro-hybrid composites can be mainly attributed due its innovative resin-matrix with self-etch bonding. Samples evaluated in this study were prepared on a bench top with ideal access, adequate visualization, and moisture control. However, longitudinally followed randomized clinical trials that explain the behavior of these materials when in function within the stomatognathic system are required to validate this result. Within limitations of this in vitro study, it is concluded that there was no significant difference in the degree of microleakage between all the restorative materials at the occlusal margin. There was a statistically significant difference in the degree of microleakage between all the restorative materials at the gingival margin. Silorane-based microhybrid composite showed the least leakage, followed by the methacrylate-based nano- and micro-hybrid composites. Lutz F. State of the art of tooth-colored restoratives. Oper Dent 1996;21:237-48. ADA Council on Scientific Affair & ADA Council on Dental Benefit Programs. Statement on posterior resin-based composites. JADA 1998;129:1627-8. Feilzer AJ, De Gee AJ, Davidson CL. Curing contraction of composites and glass-ionomer cements. J Prosthet Dent 1988;59:297-300. Labella R, Lambrechts P, Van Meerbeek B, Vanherle G. Polymerization shrinkage and elasticity of flowable composites and filled adhesives. Dent Mater 1999;15:128-37. 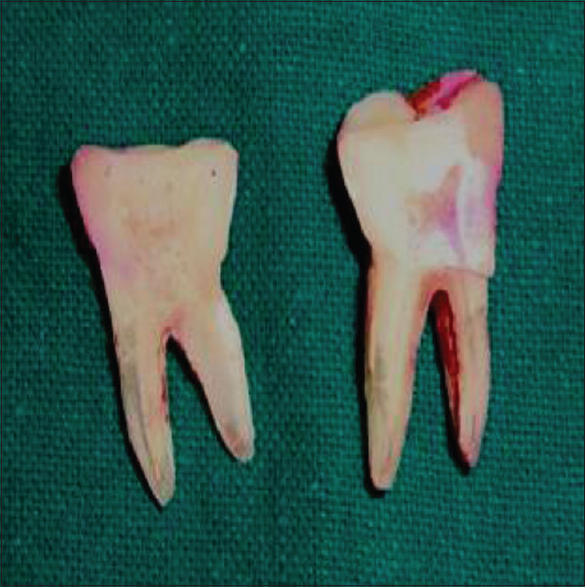 Jörgensen KD, Asmussen E, Shimokobe H. Enamel damages caused by contracting restorative resins. Scand J Dent Res 1975;83:120-2. Choi KK, Condon JR, Ferracane JL. The effects of adhesive thickness on polymerization contraction stress of composite. J Dent Res 2000;79:812-7. Rees JS, Jacobsen PH. The polymerization shrinkage of composite resins. Dent Mater 1989;5:41-4. Braga RR, Ferracane JL. Alternatives in polymerization contraction stress management. Crit Rev Oral Biol Med 2004;15:176-84. Goldman M, Simmonds S, Rush R. The usefulness of dye-penetration studies reexamined. Oral Surg Oral Med Oral Pathol 1989;67:327-32. Triadan H. When is microleakage a real clinical problem? Oper Dent 1987;12:153-7. Going RE, Massler M, Dute HL. Marginal penetration of dental restorations by different radioactive isotopes. J Dent Res 1960;39:273-84. Zander HA. Pulp response to restorative materials. J Am Dent Assoc 1959;59:911-5. Payne R. Marginal seal of Class II restorations: Flowable composite resin compared to injectable glass ionomer. J Clin Paediatr Dent 1999;23:123-30. Ferrari M, Davidson CL. Sealing capacity of a resin-modified glass-ionomer and resin composite placed in vivo in Class 5 restorations. Oper Dent 1996;21:69-72. Lee IB, Son HH, Um CM. Rheologic properties of flowable, conventional hybrid, and condensable composite resins. Dent Mater 2003;19:298-307. Munksgaard EC, Hansen EK, Kato H. Wall-to-wall polymerization contraction of composite resins versus filler content. Scand J Dent Res 1987;95:526-31. Kirk RE, Othmer DF, Kroschwitz J, Howe-Grant M. Encyclopedia of Chemical Technology. 4th ed. New York: Wiley; 1991. p. 397. Moszner N, Klapdohr S. Nanotechnology for dental composites. Int J Nanotechnol 2004;1:130-56. Eick JD, Kotha SP, Chappelow CC, Kilway KV, Giese GJ, Glaros AG, et al. Properties of silorane-based dental resins and composites containing a stress-reducing monomer. Dent Mater 2007;23:1011-7. Degrange M, Roulet JF. How much sophistication do we need? J Adhes Dent 2000;2:247.